I bought a laurel tree on a whim last summer. I had a brain fart, standing there among the plants at the farmers market, and was sure the laurel was sacred to Athena and thus so appropriate for me to bring home–and we’d have European bay leaves as well as the bay laurel I get from the hills here! S’okay, Apollo has his place as well. 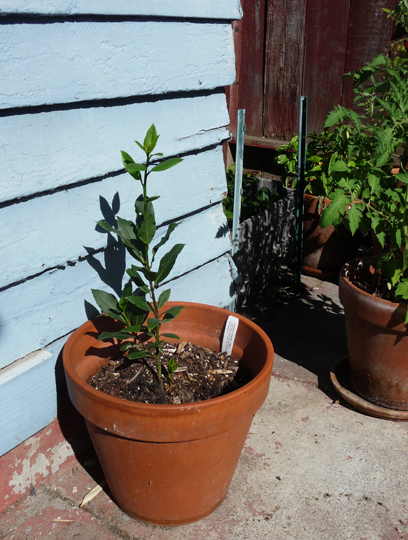 When he’s not mistreating dryads, that is… I repotted the laurel and it managed to survive many months of being on the front steps till the chickens moved to San Francisco. It gained maybe three or four inches in height stuck out there with nothing but a couple of hours of morning light. Since it moved to the back yard it has more than doubled in size. Having a partner who knows how to care for plants has certainly helped. She trimmed me a few leaves that she said were sapping its strength and now she says we have to repot it. I looked at the little stake that says it can get up to forty feet high and decided against planting it in the yard, much as I would like to. What an addition to the urban forest, after all. But we have the tiniest yard on the block. Better to confine timbertoes a bit until our situation changes and I can give it a home suitable to its possible stature. I wasn’t able to busk today. My arm and neck told me to knock it off and I have learned to listen to such things. I’m no longer in pain, and I managed to write the lyrics to the Lugh song I’ve been working on. I keep reminding myself that the worth of the journey is not solely measured in its speed. I have to work tomorrow, which means sewing canvas, teaching volunteers, and being fit to do so.